I am thrilled to announce that my breast cancer memoir, FLAT, is forthcoming from Skyhorse Publishing (September 2018). I am super-duper thankful to my partner, Mary; my agent, Helen Zimmermann; and my writer peeps at Grub Street. 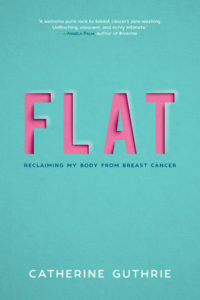 FLAT is a queer, feminist breast cancer narrative the likes of which I desperately wanted to read but couldn’t find when I was going through treatment from 2009-2011. My goal in writing FLAT is to expand the conversation among breast cancer patients and their surgeons. Many surgeons (knowingly or not) pressure breast cancer patients to reconstruct. “Going flat” is rarely mentioned because we are taught to see breasts as paramount to a woman’s happiness. But, in the years since my own surgeries, I’ve heard from dozens who felt pressured to reconstruct and were summarily blindsided by complications, lasting pain, and countless follow-up surgeries. Of course, many breast cancer patients love their reconstruction. I’m genuinely happy for them. My argument is that women need comprehensive, unbiased information to make educated health care decisions and, right now, that’s not happening. So, the seeds of what would eventually become my memoir, FLAT, were sown on this blog. Many readers encouraged me to write a memoir, and I naively thought a book would be a natural extension of my blog entries. Um. No. When I moved from Bloomington, IN, to Boston, MA, in 2012, I took my first memoir-writing class at Grub Street, the nation’s largest non-profit writing center. By the end of my first class I was hooked AND I realized blogging and literary memoir had nothing in common. So, I spent the next three years learning how to write literary memoir at Grub Street. The most amazing and rewarding experience was participating in the Memoir Incubator, a year-long MFA alternative, taught by Alexandria Marzano-Lesnevich, author of The Fact Of A Body: A murder and a memoir. I couldn’t have written FLAT without Grub Street and Alexandria. I can’t wait to share it with the world. October 2018 will be here before I know it, and, in the meantime, I’m going to keep blogging about going flat.